I shall introduce you to “Caitlin”. Now I don’t know the story behind the name but that was the mini-campervan my girlfriend and I were given for our California road trip when we went to pick up our rental from Lost Campers USA in Los Angeles. Clean and ready when we arrived, we were given a ‘tour’ of the vehicle, signed some paperwork and within minutes the Lost Campers staff had us on our way. Caitlin would now be our home for the following 6 days. With a comfy mattress, an interior table and sink and everything from an awning to outdoor chairs and tables, a cooler, a propane stove, cooking equipment and storage compartments, we had everything we could possibly need for our adventure. 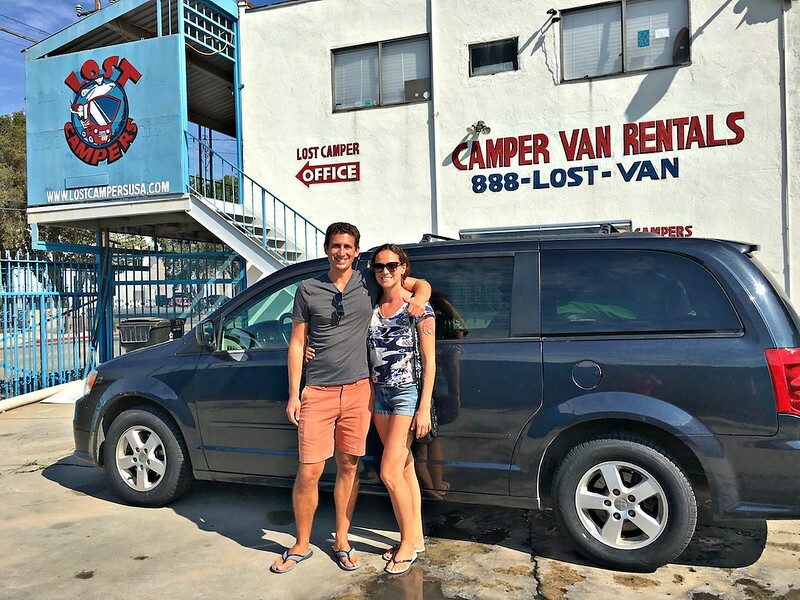 We were excited to get started and as we turned out of the parking lot near LAX and onto Aviation Boulevard, we knew that traveling in such a van was a wise decision for a budget California road trip. It wasn’t long into our adventure, about eight minutes to be precise, when we agreed to have a coffee stop. And you know how it goes, with all the traffic in LA and difficulty finding a parking spot, this turned into a much longer break than expected. Eventually though, with coffee in hand, we got back out on the road, meandered through the streets of Santa Monica and onto the Pacific Coast Highway. We were feeling good. We were feeling clean (this would change quickly). And we were feeling energized. We rolled along, passing Malibu and Ventura, until we reached the town of Santa Barbara in time for lunch. We ate at the Santa Barbara Public Market, an indoor food hall on the corner of West Victoria and Chapala Streets that was a great spot for a fresh meal (we went with poke bowls, highly recommended), before stretching our legs on a long walk down State Street. And then, like true campervan novices, we spent an hour in the Ralph’s supermarket trying to figure out what kind of supplies we should buy. Bananas, wine, granola bars, water, tea and mandarins seemed like all we needed in the end. In the early evening we pulled into Pismo Beach and went for a walk through the historic, yet tiny, downtown and beachfront, not quite attracted by the shops and restaurants enough to stick around longer but satisfied with our first glimpse of the beach. We continued north and upon arrival in Morro Bay, decided to pull into a campground for the night. The only problem was that all of the campgrounds were completely full, leaving us no choice but to try and find a quiet spot to park, and hide, our van for the night. Twenty minutes later we found that spot. I backed the van up into a corner at the very end of a quiet road along the beach, where we were hidden by a huge pickup truck parked in front of us. And from this location we enjoyed dinner and a bottle of wine in front of the ocean before falling asleep, and eventually waking up to, the sound of the waves, all from the comfort of our campervan’s bed. Awake and ready to go by 8:00am, we stopped for coffee and breakfast at the Luna Coffee Bar in the quiet village of Cayucos before continuing along the coast. After 30 minutes we reached a turnoff that lead to an ‘elephant seal viewing point’. And then we almost missed seeing the elephant seals. I made the brilliant suggestion to walk along a quiet path to the left, from where we soon saw 3 small seals lying on the sand off in the distance. 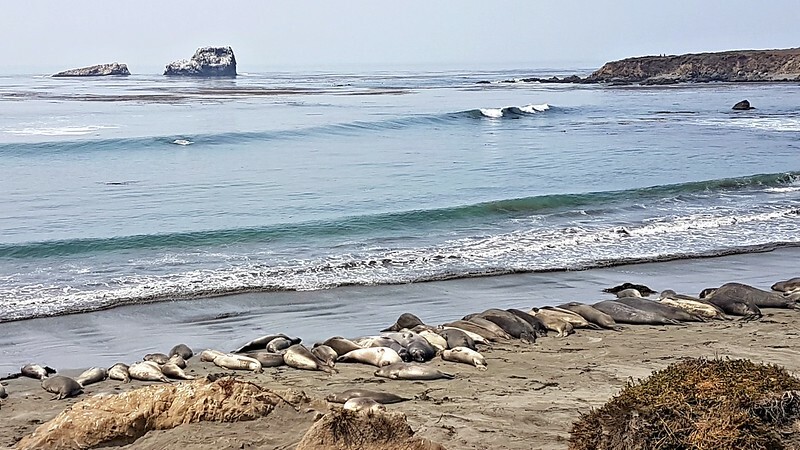 Luckily, when we returned to the van, my girlfriend suggested that we walk the other way for a moment and sure enough, that’s when we came upon the dozens of massive elephant seals that this area is known for. 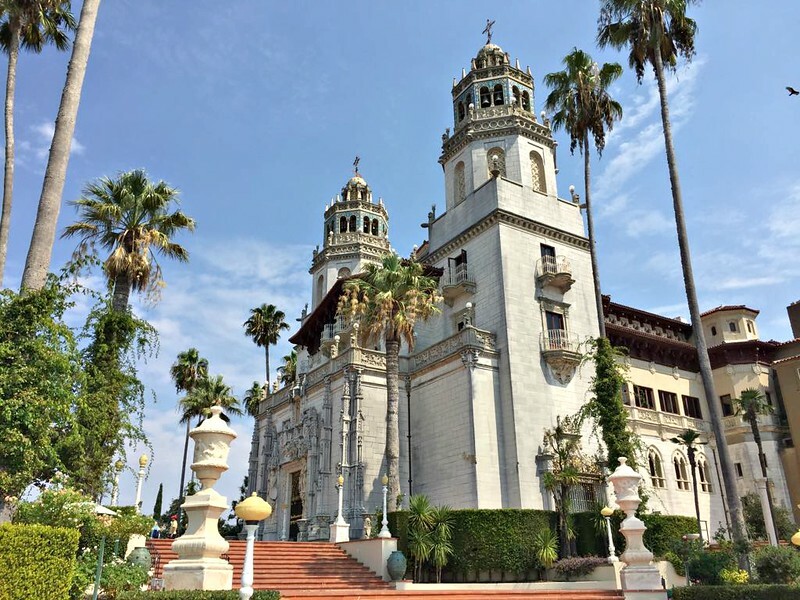 It wasn’t even 9:30am when we reached our second stop of the day – the Hearst Castle. 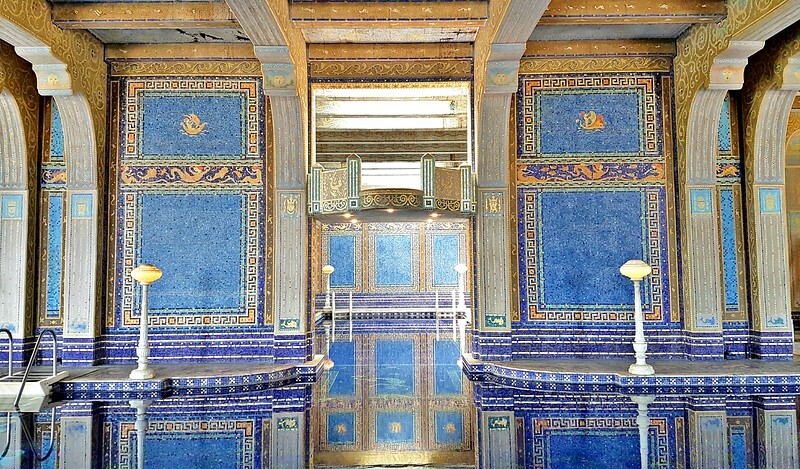 For years I’ve wanted to visit this bizarre mansion built in the early 20th century by newspaper magnate Willian Hearst and now that I have visited, I would recommend it to anyone on a California road trip in this area. 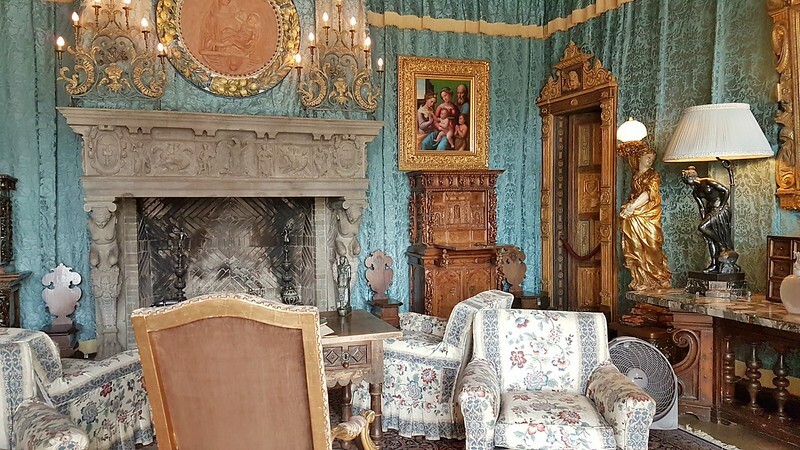 We took the one hour Upper Rooms tour with one of the best tour guides we’ve ever encountered and we then spent some time on our own wandering around the expansive gardens and surreal indoor pool. The ‘castle’ is too crazy and everything from the hilltop location to the zebras (yes, zebras) to the architecture to the ancient artifacts to the interior design to the stories behind every room simply cannot be imagined without being there. Awesome place. First, let me state that despite not having a real plan for our road trip, there was actually one place that we really didn’t want to miss – the Henry Miller Memorial Library in Big Sur. My girlfriend is a huge fan of his writing and I’m slowly learning more and more about him and his works. 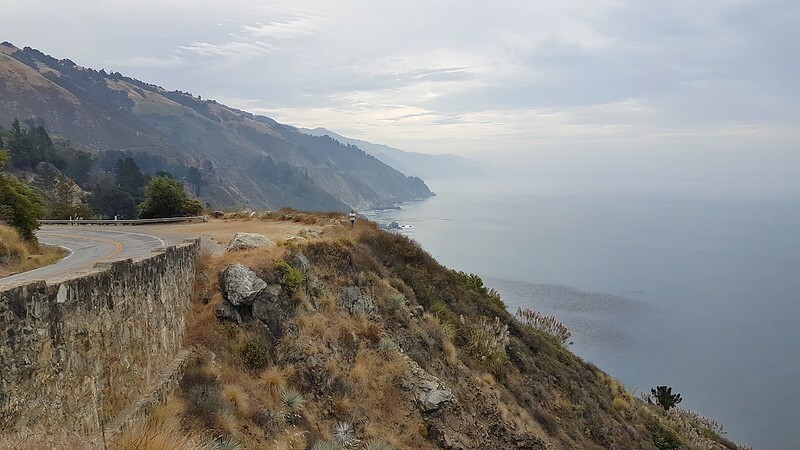 While located only 30 miles up the road from Cambria, due to the landslides earlier this year that knocked out a couple of bridges along the coast, a long 100+ mile detour was now required to get in and out of Big Sur. We still planned to make the trip though. So, after our lunch, while sitting in the campervan browsing the internet for a few minutes, I suddenly discovered that the Henry Miller Memorial Library had revised their opening hours because of the drop in tourism after the landslides. They were now only open Thursday to Sunday, 11am – 6pm. It was Sunday. It was 3:01pm. According to Google Maps, we were 2.5 hours away with the detour. And off we went…Route 46 over to Route 101 and up to the Nacimiento-Fergusson Road which then took us on a 60 mile adventure through wine country, an eerily quiet stretch of US Army-owned land, the alluring depths of the Los Padres National Forest and the towering Santa Lucia Mountain Range, with its dozens of dangerous turns and lack of barriers protecting you from a long fall of a cliff. It was a wild detour, gorgeous and energizing, yet slightly nauseating, especially given our time constraints. We pulled into the Henry Miller Library at 5:35pm. I’m not sure what was more exciting, being at the library or the journey to get there but we thoroughly enjoyed the 25 minutes we spent wandering around the building, speaking with staff, flipping through books and soaking up the atmosphere. Our dinner that night consisted of sandwiches bought from the only open shop in the area, the Big Sur Deli, which we ate at the best view point we could possibly find. After dinner, we pulled into the corner of a small parking lot back near the Big Sur Deli, where we promptly passed out on the bed in our van, quite satisfied with the happenings of this lengthy day. The second landslide was just north of where we slept and so on this day, we had no choice but to head back south. We took our time, stopping at several view points along the way until we reached the tiny community of Plaskett. And wherever we stopped, we always had the spot to ourselves, something I never imagined possible along this famous route. After a lunch overlooking the coast (doesn’t get old!) and a drive up to a mountaintop hermitage that turned out to be closed, we turned back onto that Nacimiento-Fergusson Road from the day before, also the only route out of Big Sur. But this time, we would do things a little differently. Once at the top of the mountains, we decided to get off the paved road and head onto a dirt track called the Coast Ridge Trail. We were’t exactly sure but looking at Google maps, this route appeared to offer a nice loop that would end up right where we wanted to be later in the day. We entered extremely remote territory, with not a person, house or sign of civilization to be found. The dirt road was stunning, cutting into the sides of mountains and along impossibly narrow ridges while offering far-reaching and spectacular views in all directions. To complete the loop, we had to turn onto a second dirt road. This second road was insane. Even narrower and with extremely steep inclines and declines, soft dirt patches that were tough to drive through and sheer drop-offs at all times. It was also insanely beautiful (as you can see in this video!). After thinking we would be stuck in the middle of nowhere while trying to get the van out of some soft sand for the sixth time, we eventually reached the Nacimiento-Fergusson Road once again and continued our journey away from the coast. After this long day, we decided to spend the night at an RV camp in the small town of Greenfield, right on Route 101, partly because we couldn’t find anything else and weren’t in the mood to keep on searching. Among the huge RVs and massive trailers, we backed up our little minivan into its spot and had a quiet night, and our first shower that didn’t involve splashing water onto our bodies from a sink faucet in a rustic outhouse or bathing in a cold creek (which was actually quite nice). After breakfast at the Denny’s in the town of Soledad (what would a US road trip be without one breakfast at Denny’s? ), we decided to drive into Salinas, the hometown of John Steinbeck, for a wander through its quaint downtown area. From here we continued to the coast until we reached Monterey, where we had decided to meet up with my friend Jerry. And most importantly, awesome company. Over a couple of bottles of wine, we all spent a few hours that night talking and laughing about Monterey, about authors and books, politics, our jobs and our other interests. It was simply a great night. After brunch with Jerry at the excellent Wild Plum Cafe in town, it was time for us to hop back into our van. 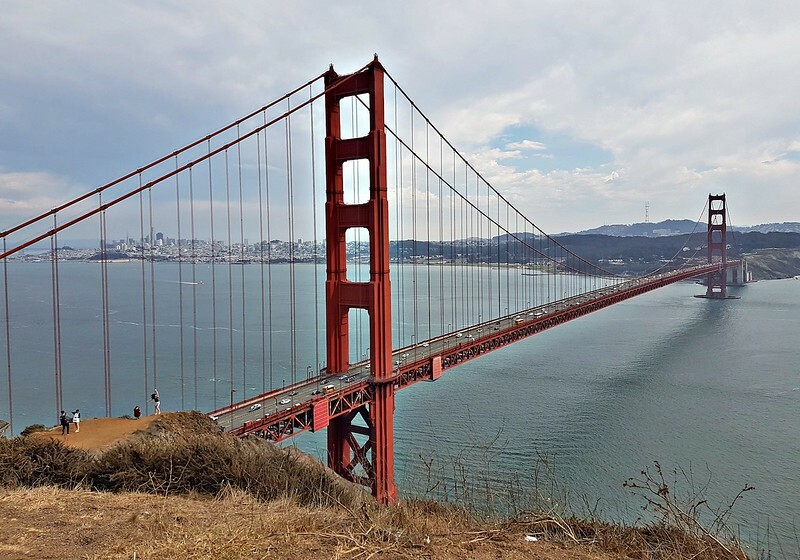 Our stay in Monterey, which also included time wandering Cannery Row, downtown and the beach, was short but perfect and as a result, we didn’t feel the need to visit any other towns. 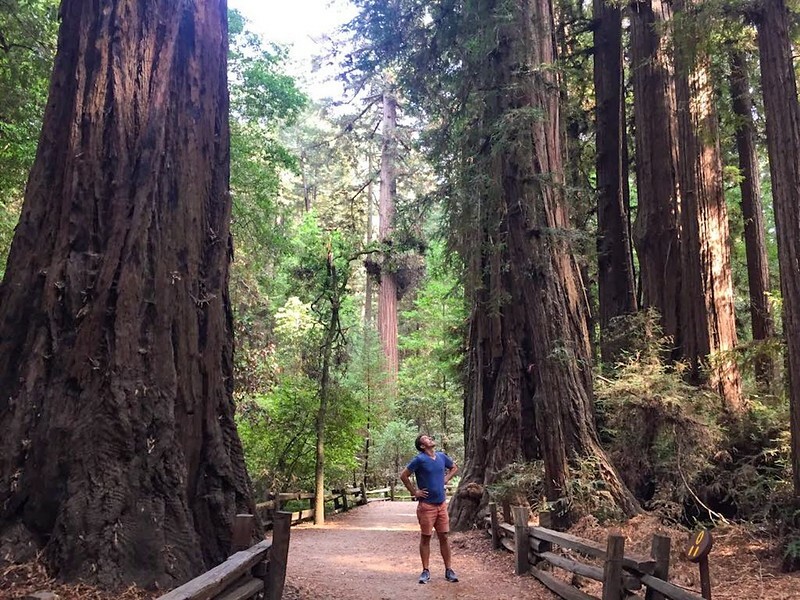 We drove right through Santa Cruz and onto Route 9 until we reached the Henry Cowell Redwoods State Park instead. It was our first encounter with the redwoods and this little park was an ideal location to get out into nature and be among these massive, mesmerizing trees. Then, before we knew it, the time had come to find a place where we could enjoy our final evening with the campervan. 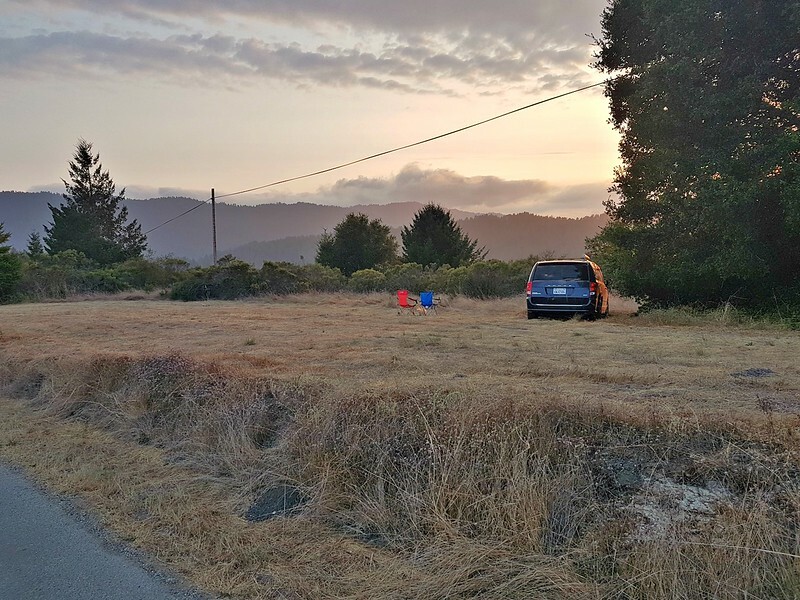 We continued into San Mateo county along small roads for about an hour and a half, randomly turning right and left several times, until we came upon a one lane, cracked pavement path that seemed worth checking out. We followed it for about 2 miles and it eventually led us into the Pescadero Creek Park, a park that seemed to be long forgotten given the condition of its gate and entry way and the complete lack of even a trace of visitors. As a result, we were thrilled and we soon found a small clearing right up on a mountain ridge. This would prove to be the idyllic location we had hoped for. 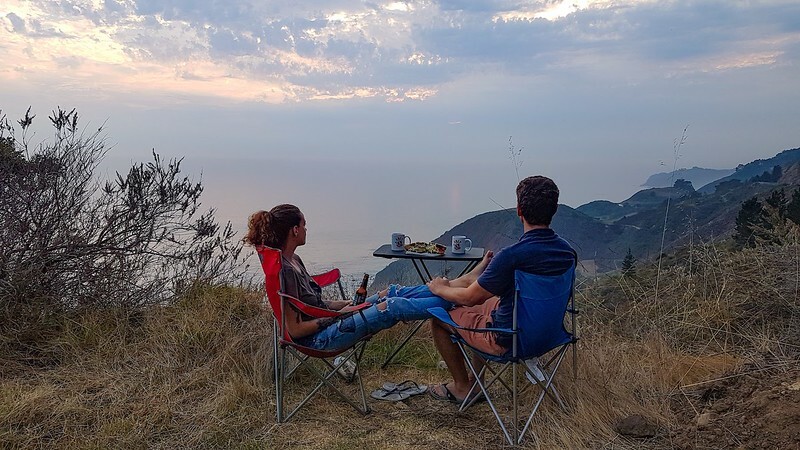 We pulled out the chairs from the van just in time for sunset, poured some wine, put on some music and, despite having forgotten to buy dinner and with only granola bars to eat as a result, we dug in for one final night among the beautiful California nature. Waking up early in the midst of some heavy, wet fog, we did some work (despite the remote location we had great 4G coverage! ), organized all of our stuff and then quietly began the last leg of our California road trip. Two hours later we pulled into the Lost Campers parking lot in San Francisco, climbed out one last time and just like that, dropped off our trusty campervan. 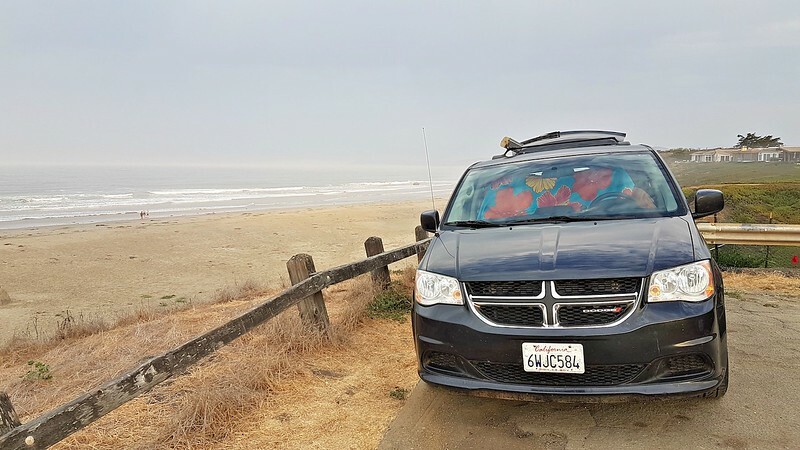 A California Road Trip in a Mini-Campervan? Is a mini-campervan right for you? I’d be curious to hear your thoughts. 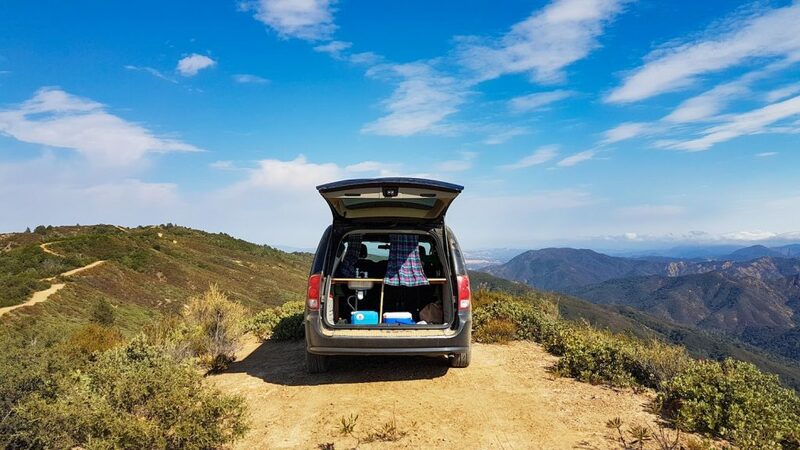 After our experience, we realized that the main downside of such travel is that it can be a little cramped as there isn’t a huge amount of space inside the minivan. Apart from that though, it’s definitely an ideal option for travelers that simply need a place to sleep and the basic amenities for their road trip. For one or two people, it works out very well as the small van allows you to travel on any road and you always have a bed to lie on. If you use campgrounds, the real mattress inside the van is far more comfortable than sleeping in a tent and you’ll also have all the equipment you need to prepare your meals. And when split among a couple of travelers, the price is more than reasonable since you get both transportation and accommodation in one. 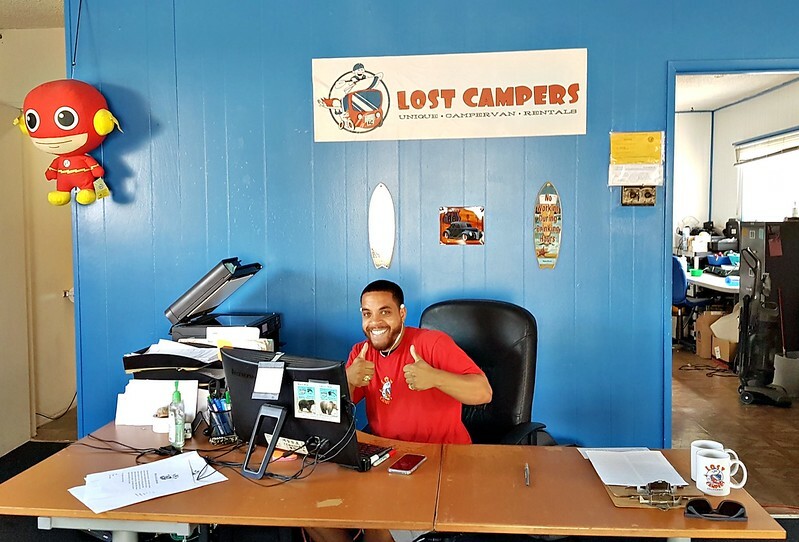 As for Lost Campers themselves, the staff are extremely helpful and the company’s culture seems to truly revolve around making their travelers happy. I know a couple of readers wrote to me after my last post to say they had an awesome experience with this company too. The vans and equipment are in good condition, the rental process is hassle-free and they have three convenient locations as well (Los Angeles, San Francisco and Salt Lake City). If this is your travel style, Lost Campers USA is well worth checking out for a California road trip, or any road trip in the western USA! Would you travel in a mini-campervan? Any questions about the road trip or the campervan itself? Let me know! Hey Earl, hope you’re well. Myself and my girlfriend are doing a Northern USA roadtrip next summer for 2 to 3 weeks. What was your daily cost on average for this trip, including everything? Hey David – When it averaged out, the cost of transportation, fuel, the occasional camping fee (when we stayed at an organized campground with the van) and food (which we often bought at the supermarket), was about $130 USD per day. I absolute love the road trips around the USA. I’ve only been to America once, but we road-tripped across 4 states (California, Arizona, Denver & Utah) in January! It was awesome, but we did have a few hairy moments on the cliff, and a couple of roads were closed because of the snow. We also used Google map and a Navigator which up in the mountain proved to be quite useless as we ended up in the middle of no-where one night with signs saying “This is the wrong direction” literally, in a very dark unfenced field…! So we drove backwards and ended up in the right direction 2 hours later close to midnight. Thank goodness my German husband is an excellent driver ‘cos I don’t drive…! Would I travel in a mini-campervan? Not with a husband AND a teenaged boy! Hey Victoria – Yes, I think that would be a little too cramped for 3 people 🙂 Glad you had an awesome road trip experience in the US though. Those are definitely some of the best states for such an adventure! Cute van! I love how these services are being offered now so everyone can experience camper van living! Hey Jerry – Looking forward to the next time we hang out! How many hours in total did you spend on the road? We did a trip from San Francisco to Yosemite to Reno to Vegas and were on the road for about 30 hours in total in around 6 days. Hey Eric – I’d say we spent a total of 25 hours on the road in total, mostly due to the landslides that required us to back track. Hey Grant – That’s one of my favorite movies of all time! Hey Earl – Yeah, it’s good to know where it might and might not be a good idea to pull over for the night 🙂 I’ve done the Great Ocean Road as well, not in a camper, but camping along the way in a tent. It’s definitely an ideal route for a camper though! I’m so happy you have a girlfriend now!!! Congrats! It sounds like you had a great time. I’ve lived in CA all my life, done that trip many times, and still get excited at the thought of doing it again. About 30 years ago we camped on the edge of a Big Sur cliff in an ’84 VW Vanagon with two young kids. Some time I’ll tell you the story of the Easter Egg hunt in poison oak. I love that early morning smell of the fog blowing up a ridge, through the tall grass. I lived in Mill Valley until I was seven and still have great memories of the redwood forests; so peaceful. Thanks for the memories. I’m ready to go again. I’m reply to myself. I just realized the Nacimiento – Fergusson Road starts at the Kirk Creek campground. That is where the Easter egg hunt in poison oak took place. It’s one of my favorite campgrounds anywhere but it’s first come – first served and now very difficult to get into. Listening to seals bark in the early morning; wonderful. Hey Doug – We saw that campground too, looked great but was definitely full since there weren’t many around that area at this time. But in Big Sur it was also easy to just tuck away in a corner and nobody seemed to mind! Hey Doug – Any time! And I can easily see why this trip would be appealing more than once, if not unlimited times! Just to be driving along Big Sur in the evening or the early morning, with almost nobody else around (which I know is not always the case), stopping everywhere to soak it all in, definitely was a major highlight! This looks like a fantastic journey and reminds me of when my husband and I traveled around all 48 states for 4 months in a Volkswagen van. One of our best trips ever. Look forward to more of your travels. Hey Lisa – I could see how that would be one of your best trips ever!! Hey man, awesome trip! The next time you’re around big sur, here’s a hack. Rent an ebike for 2 days. Stop at big sur earlier than 1300 set up camp and park vehicle. Take the back trail that goes to the bridge, carrying your bike up there. 20 minutes later, you can now ride 35mph down the PCH, not have to park anywhere, and no traffic for 40 miles (roads are temporarily closed to vehicles but not bikes). Hey Mack – Thanks for that tip! We saw the electric bikes but didn’t really have time to take advantage of them. Hey David – That’s so cool to hear and you’ll love the western USA trip as well I’m sure! Sounds like a nice list of trips you have been collecting!! Yeah looks like a great idea for a road trip!! Sure looks beautiful there.. I did a road trip in a campervan in New Zealand once and it remains one of my favorite memories so far! Good to know there’s the same option in western USA and a great compay to go with!